Quantity surveyors are professional financial & contractual advisors to the construction industry. As financial advisors, they estimate and monitor construction costs, from the feasibility study stage through to the completion of the construction development project. 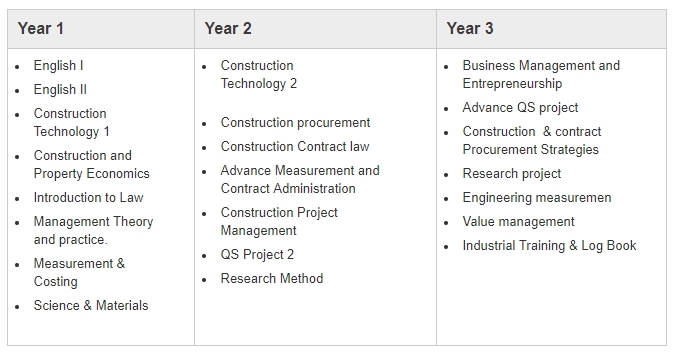 BSc (Hons) Quantity Surveying & Cost Management 3+0 (from Liverpool John Mores University, UK) trains the students with issues in organizing, controlling and managing the cost of building projects-from building economics to contracts and construction law, and from construction, technology to project management. With their excellent analytical, arithmetical and IT skills, the students are developed to be an innovative individual and team player with problem-solving and transferable skills necessary to succeed in this ever-changing field. The only private 3+0 Quantity Surveying degree provisionally accredited by MQA and Board of Quantity Surveyors Malaysia (BQSM), the graduates are able to register as Registered Graduate Quantity Surveyor with BQSM. Besides, the programme fully accredited by the Royal Institution of Chartered Surveyors (RICS) and the Chartered Association of Building Engineers (CABE).